DS Audio launches entry-level DS 002 optical cartridge | What Hi-Fi? The new DS 002 optical cartridge is based on DS Audio's high-end models, and makes optical cartridges just a little more affordable. 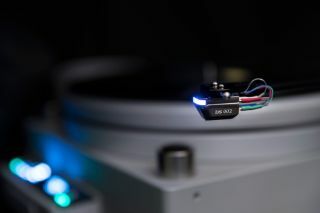 DS Audio has pioneered the use of optical cartridges for turntables, but they have tended to be on the pricey side. However, it has now introduced a cheaper model. The entry-level DS 002 takes its cues from the Master 1, which in turn is derived from the £6000 DS-W1. The DS 002 costs £4800 (for the cartridge and equaliser). Though not exactly cheap, a saving of £1200 is not to be sniffed at. Optical cartridges were originally used in the 1970s, although they weren't quite as advanced as today's models. While moving magnet and moving coil cartridges work on the principles of electromagnetic induction, an optical cartridge uses a beam of light to read stylus movement. This aims to make the cartridge lighter and more agile, and eliminate the friction that comes with using magnets and coils. The result can be a deeper, richer sound. Like the Master 1, the DS 002 works with a wider range of tonearms than the DS-W1. It also has the Master 1's enhanced optical-mechanical system and wire-suspended cantilever, allowing it to deliver an output of 500mV and more with 25dB of separation. The only noticeable difference is the materials used. The DS 002 has an aluminium chassis and cantilever, and a Shibata stylus. The phono stage is smaller and lighter, but has a shielding that isolates external noise from the power supply, while also blocking external RF and other environmental interference. The DS 002 is available now, priced £4800.